Produced in 1932, this movie camera was equipped with a lens Wollensak Velostigmat 1:1,5 25mm. It weights kg. 1,300 and its measures are the following: 52x23x154mm. It has a metal housing, covered with a black imitation leather. This machine has interchangeable lenses and has a clockwork. It used a 16mm film. This company produced this model with three variants. 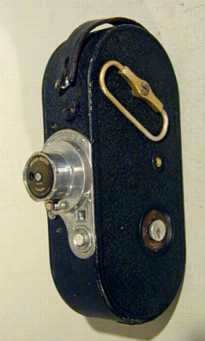 It produced also two 8mm movie cameras: the Stewart Buddy 8 Model 532A and the Stewart Companion 8 Model 532 B.